Ok, so Ran-dum is really getting somewhere. All the better when he dies. 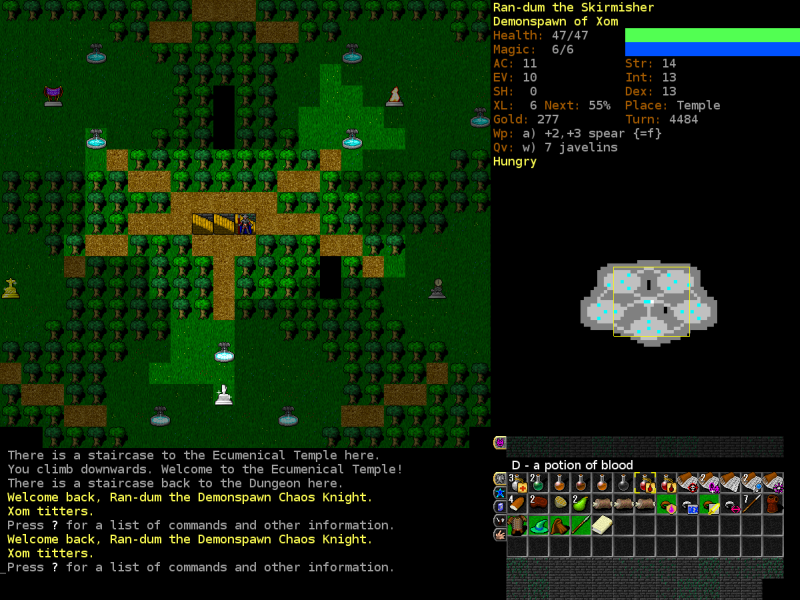 As we saw in the last update, Ran-dum had the good fortune to make it to the temple. What I forgot to mention is that he also had two potions ID'd for him. Potion of blood and potion of coagulated blood are just what they say, bottles of bodily fluids. Notable for being the vampires replacement to the normal food clock, potions of blood are rather rare and useless for most characters, providing little satiation, but are ALWAYS red in color. Over time they coagulate and eventually rot away. 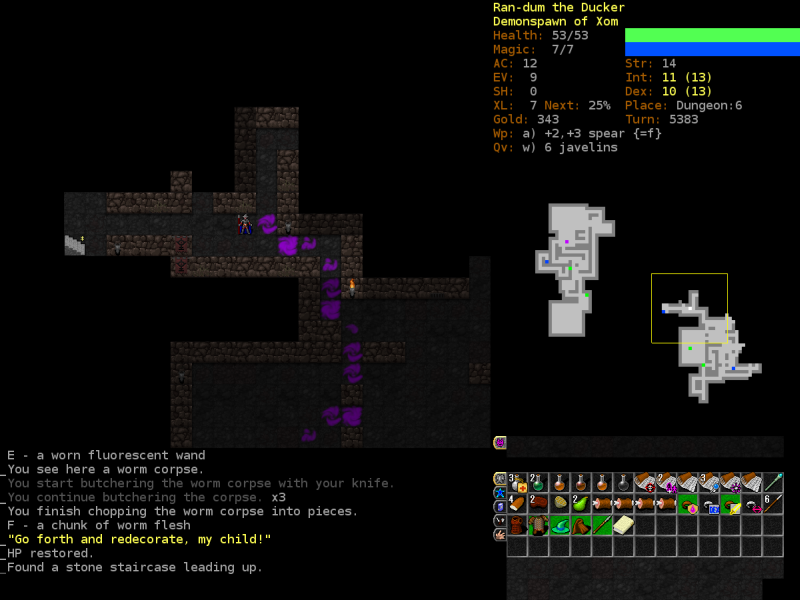 This is one of the few tricks in DCSS, and it's not very useful. We abandon the temple, no need for petty and predictable gods. 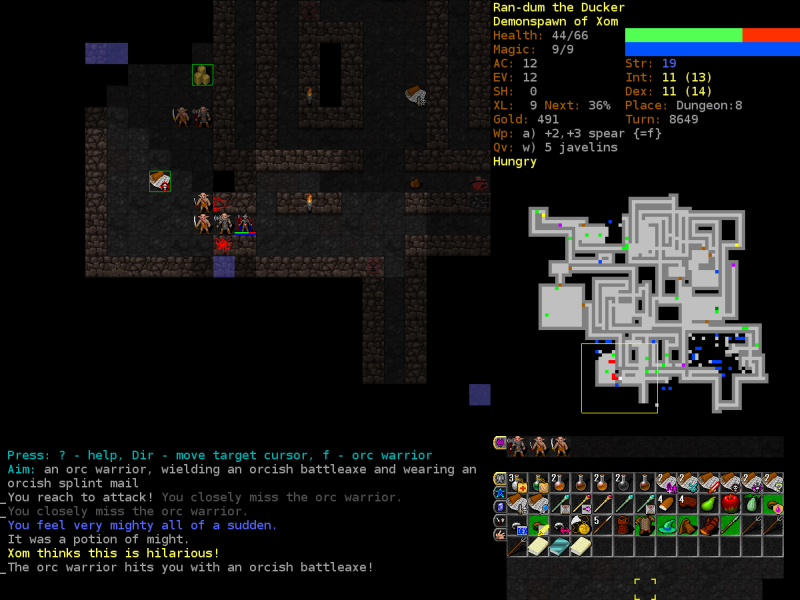 On our way out, we're greeted by a giant eyeball, literally harmless enemies who can paralyze unwary travelers so other dudes can beat them up. But, they have low HP and can't do damage on their own, so we kill this one quickly to prevent any future issues. 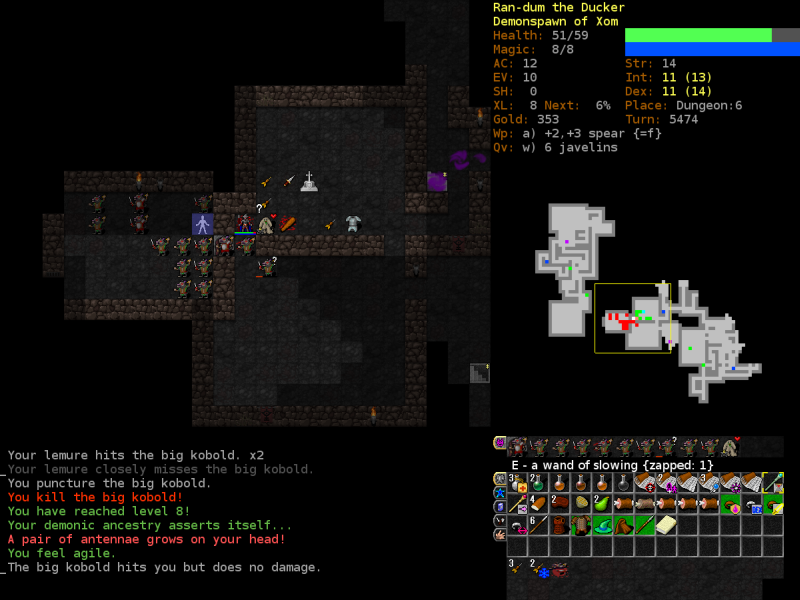 Later, an ogre gives us level 7 and Xom again reduces our dex, this time by 3 to 10. 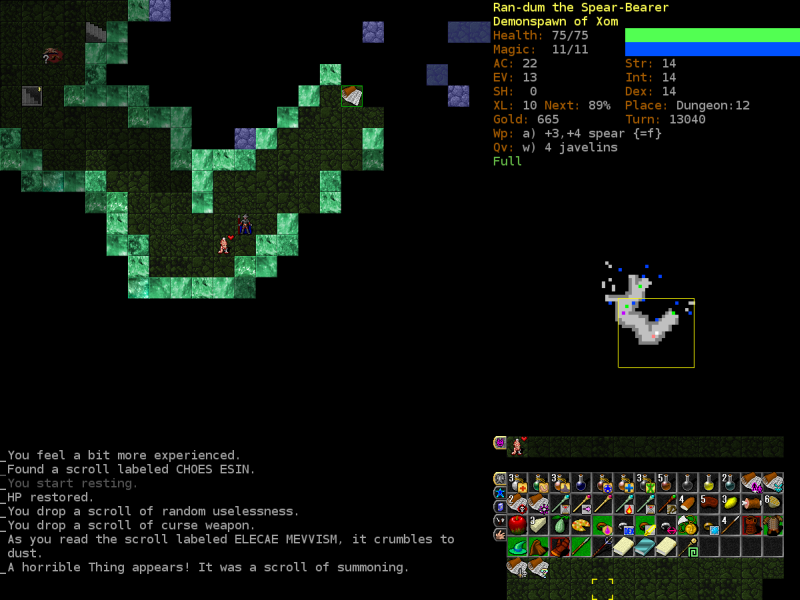 Any transmuter will instantly recognize that Xom has basically cast beastly appendages on us, a level 1 spell that morphs us, giving us a sweet unarmed attack. 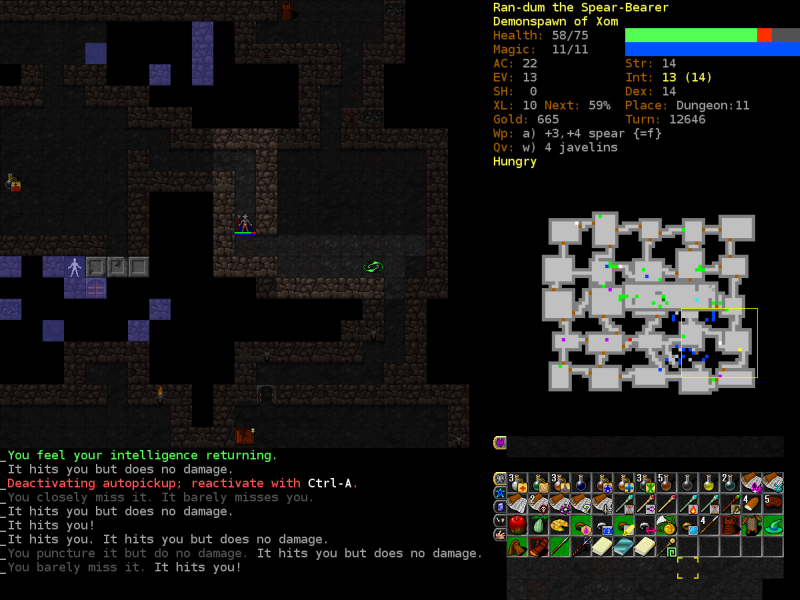 Later, He decides to reduce our int to 11, Xom just really has it out for our stats. So Ran-dum or something, it's a nice little effect that looks cool, doesn't do much else. 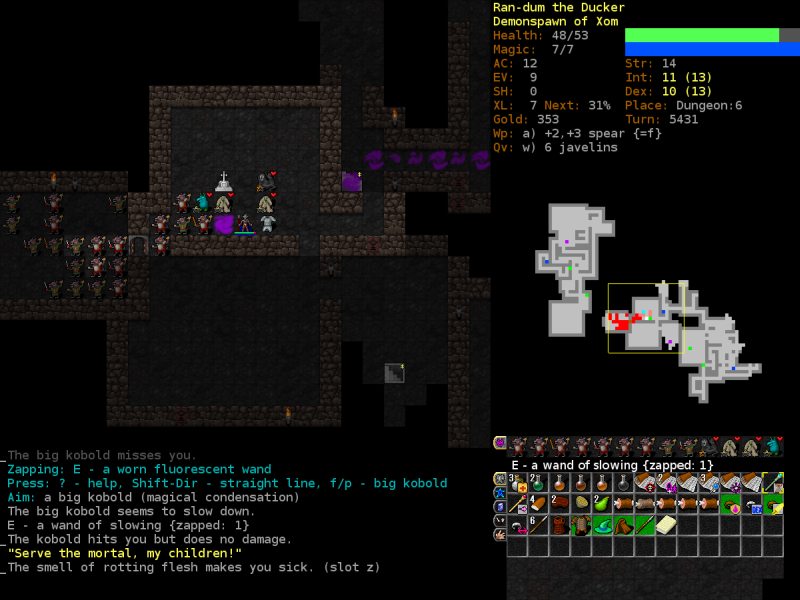 Xom summons an Ufetubu (ooh-feh-two-boo), two Lemures and a Smoke Demon to help us out. The lemures and ufetubu die like the chumps they are, but the smoke demon helps us take on the kobolds, giving us level 8. A random stat growth (dex+1) and a new mutation are our prize. A pair of antennae, these let us sense monsters around us, through walls and the like. At level 3 of the mutation we'll even be able to sense invisible things. 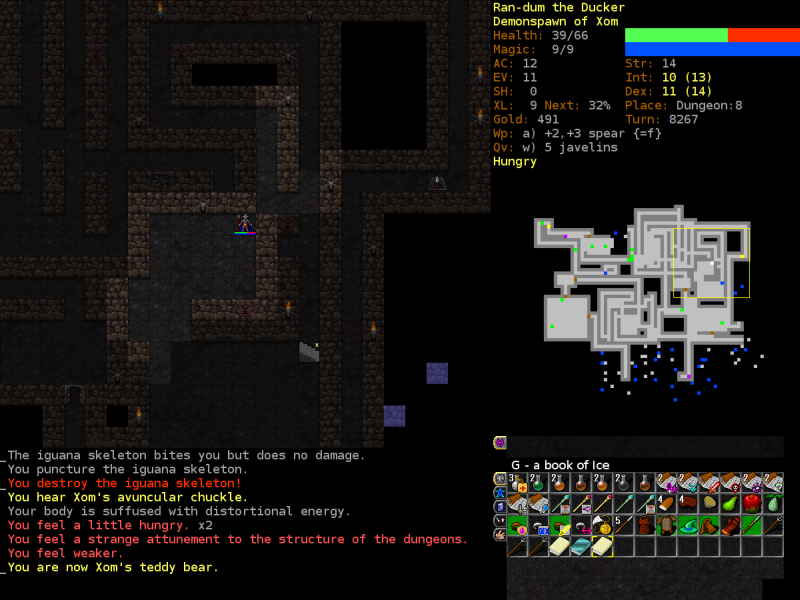 Going down to d:7 and...going up to d:6. The three iguanas are really what have me worried. I stair-dance for a few hundred turns and clear the area. 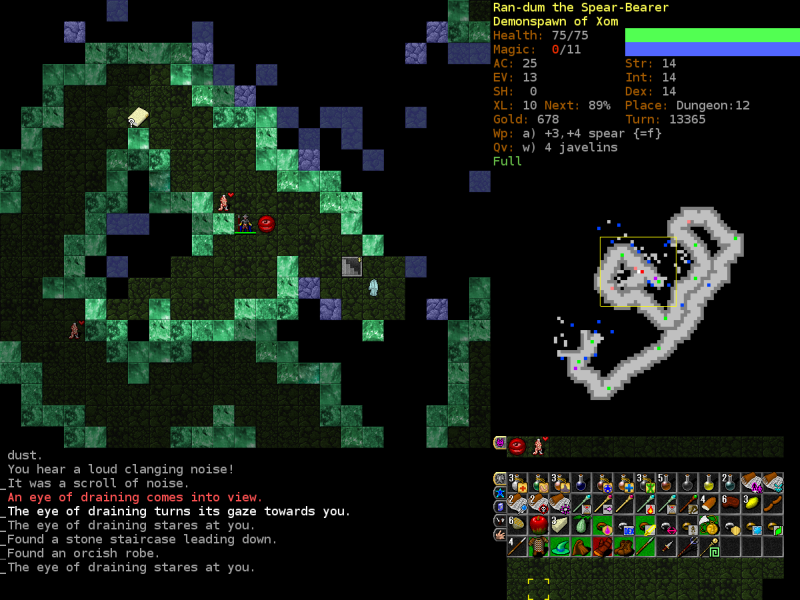 A kobold misses us and hits his centaur pal, pleasing Xom quite a bit. Exploring the rest of the level reveals that it's a + level, levels that tend to have slightly OOD enemies, large amounts of enemies, or both. 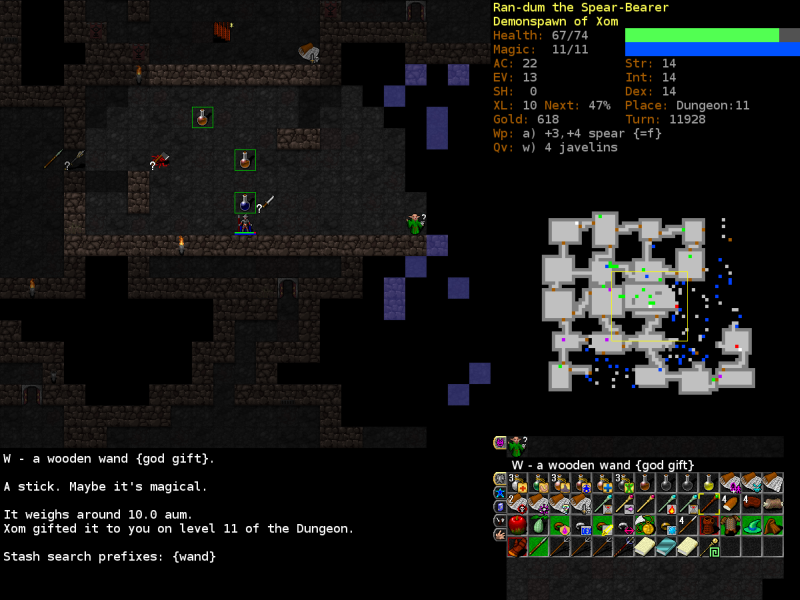 They tend to have shops or vaults with decent loot on them, but they're among my least favorite type, as a single unique can really mess you up. 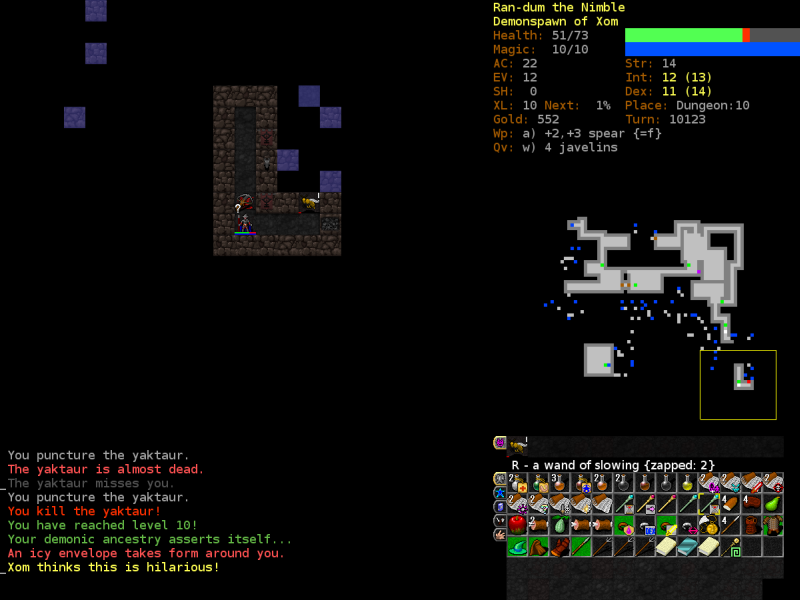 Xom decides to mutate us, making us as hungry as Testy was, reducing our strength by 1 and giving us weak passive mapping. To prep for fighting an orc warrior, I quaff an unidentified potion. 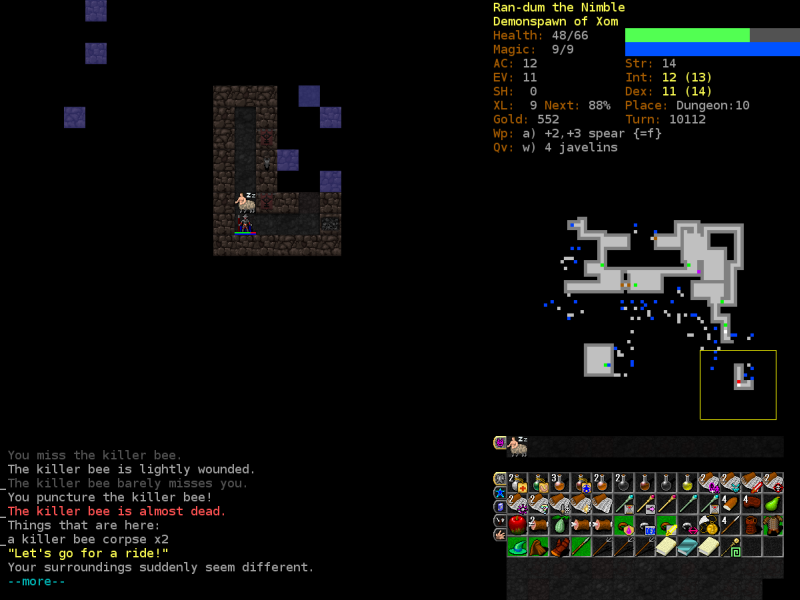 It was a potion of might, but the real outcome is that xom likes us more. Later, he grants us a gift, a staff of enchantments. Staves give the wielder a bonus to casting their types of spells and a few other things. Needless to say, it's useless to us. 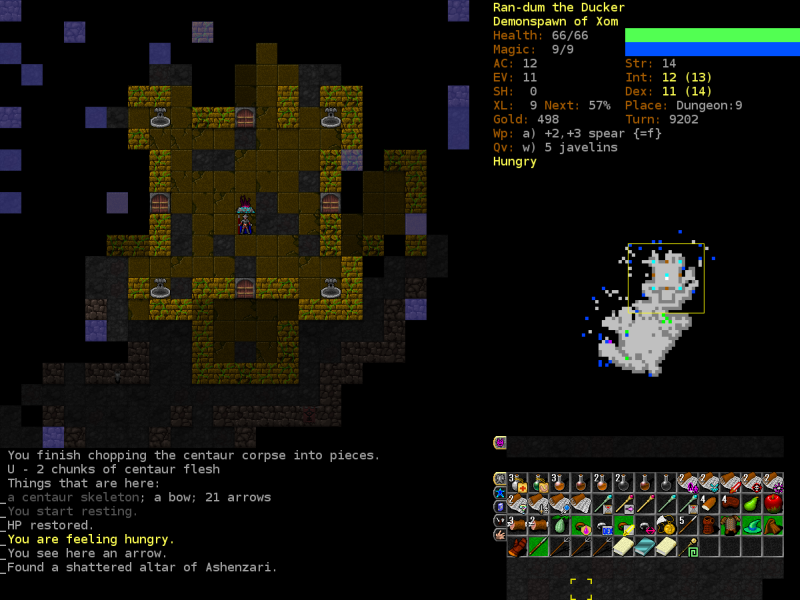 This is a really cool vault with no enemies in it, that's an altar to Ashenzeri, the shackled god of divinations. Humorously, because of our mutations we're already benefiting similarly to an Ash worshiper as he provides followers with passive mapping and locations of monsters and treasure. A hungry ghost is the spirit of a person who died of hunger, their attacks can reduce your satiation levels, a scary prospect as we're already at very hungry. 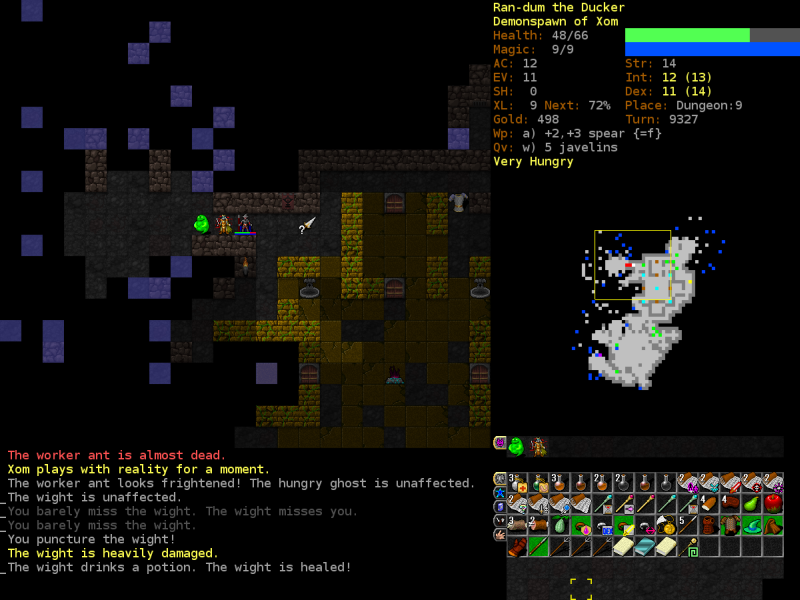 Also pictured: Wights can drink potions! Oh that's cool dude, just teleport us right next to a Yaktaur, I totally didn't want those to be a surprise or anything. We take a minute to look over our options and weigh Ran-dums strength and proceed to butcher the yaktaur. Yaktaurs are like centaurs but harder, they almost always come in packs and can make a pincushion out of unsuspecting crawlers. This gives us level 10 and an icy envelop surrounds us, a continuation of our ice-themed mutations (rC+, protecting potions,) this grants an amazing +10 AC, but can be melted by casting fire magic or getting hit by fire damage. A useful mutation to be sure. 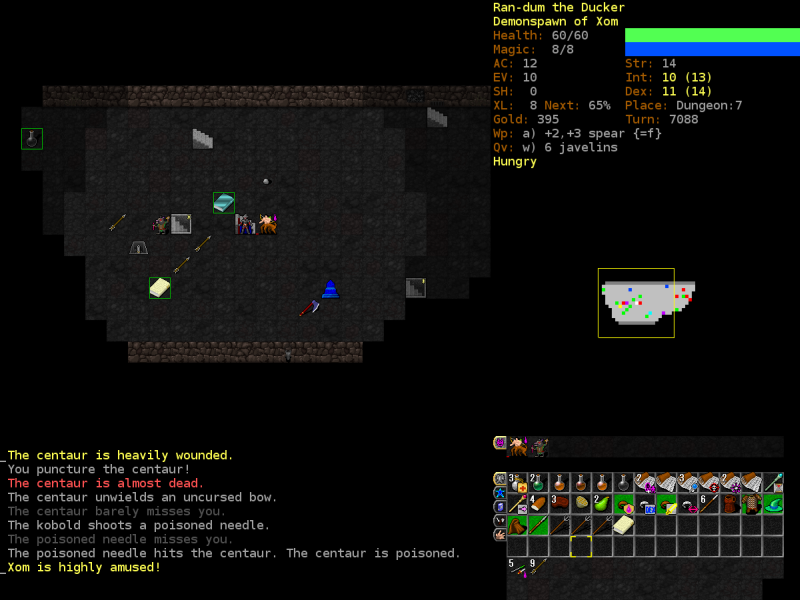 In this vault, xom grants us a wooden wand, so we test it out on the orc priest. He is hasted. 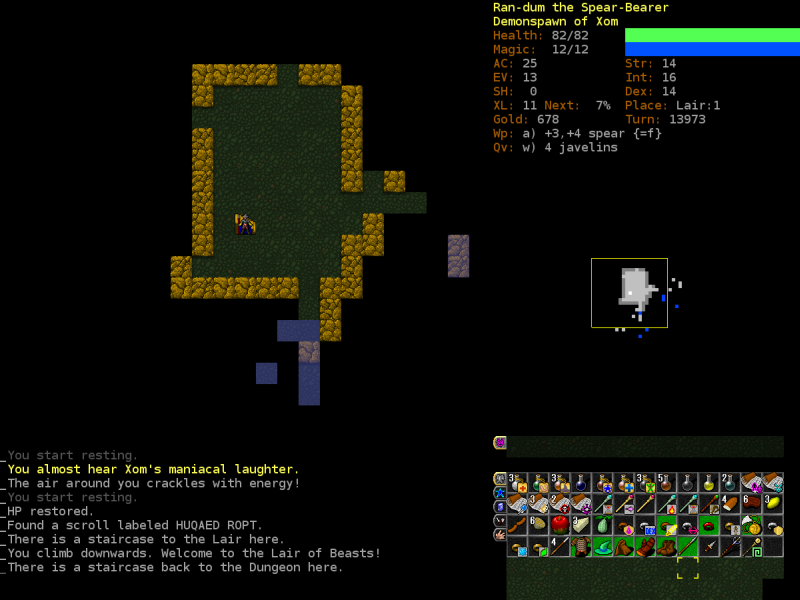 Xom doesn't audibly chuckle, but I do. 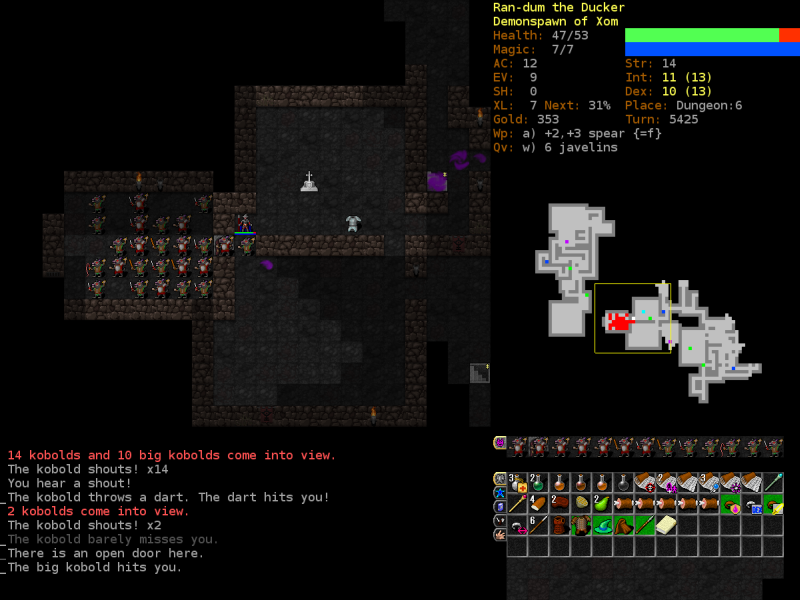 We kill the priest with no real difficulty and continue on to find the entrance to the orcish mines. This would be suicide right now, so I Jump on in. continue on my merry way. We're getting hit by something fast and dangerous, but it's invisible. Unseen horrors are like bats, but they can actually hurt you. This one is on the tiles above me, so I do a little dance and eventually kill it. Meeting this out in the open would have been potentially fatal, don't mess around with unseen horrors. Cool! Reading an unidentified scroll summons a cute little ally for us to hold and love. Scrolls of Summoning are pretty nice because they give you decent meatshields early, but horrible things taper off in usefulness later, it was best we used this now while it can still take a few hits. Also, this level is really weird and I've only seen it mean one thing, the lair is on this level. Eyes of draining are like giant eyeballs, ineffective alone but dangerous when paired with other enemies. They drain your magic pool, but we can still kill them with ease. Bam, an entrance into the lair of beasts. Oh, also a crocodile, sheep, yak, ooze, goliath beetle zombie, elephant slug and elephant. I'm really only afraid of the elephant and we have a really sweet god gift wand of hasting. 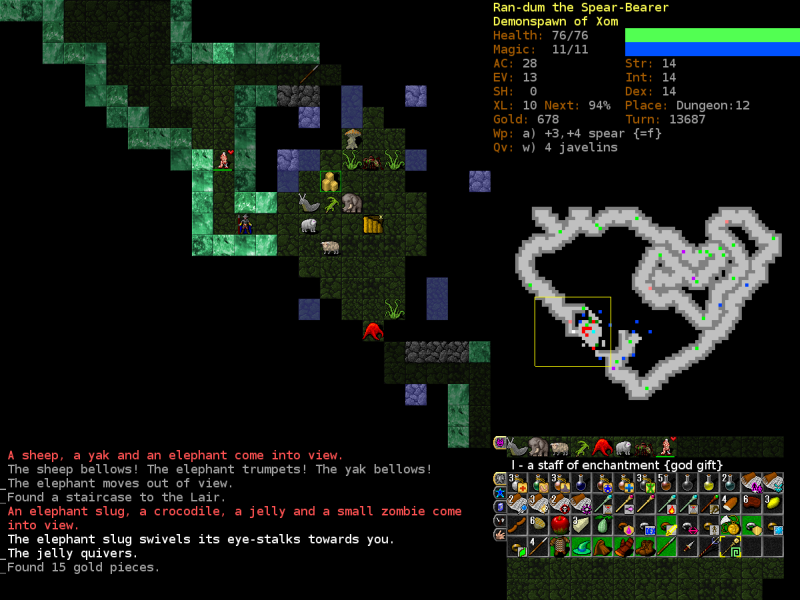 Ran-dum goes to town on the malignant beasts and we hit level 11 after killing the elephant. I underestimated the crocodile, but we pull through in fine form. 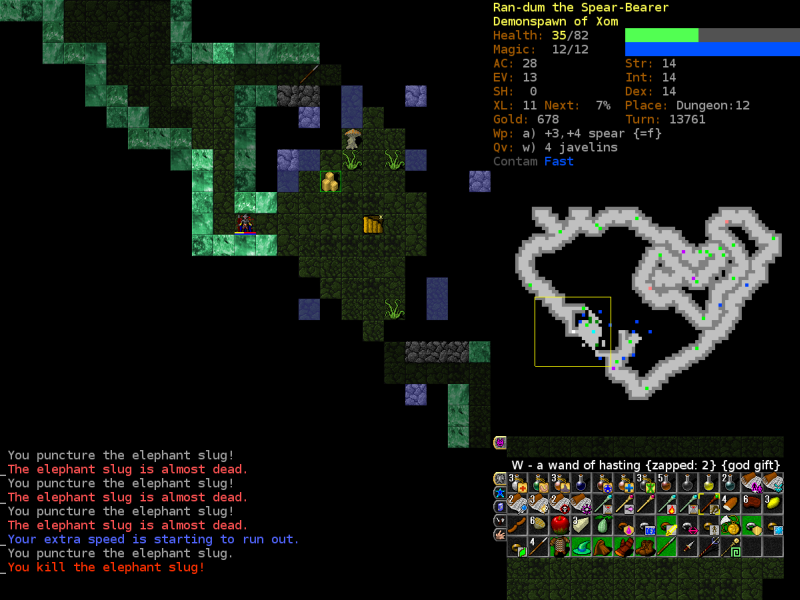 Just as the extra speed from haste wears off, we kill the elephant slug (he got no attacks off on us, they're really slow.) Wait, where's our pal? The small abomination was destroyed, sacrificing himself so the monsters would wail on him, not us, they really are pretty fragile. Truly a sad day. Welcome to the Lair of Beasts! 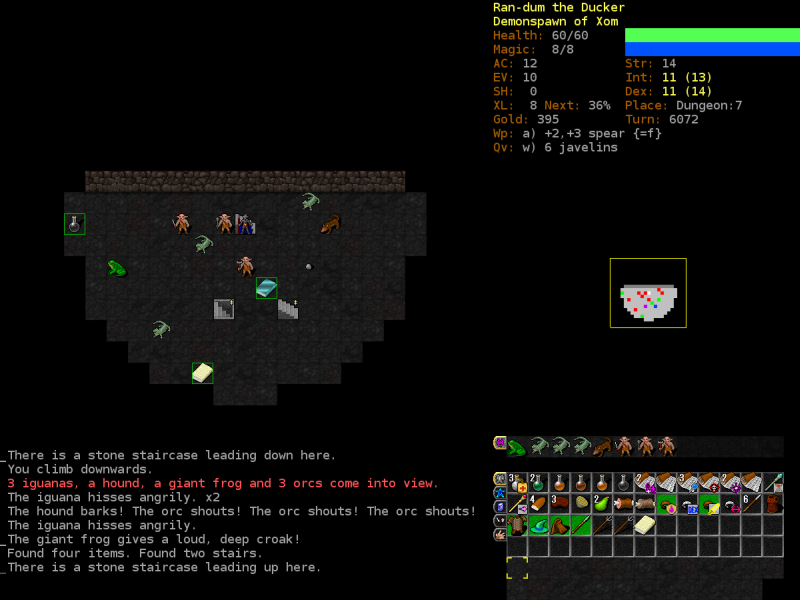 The lair is 8 levels deep and features beast-themed enemies, though uniques can still spawn here. 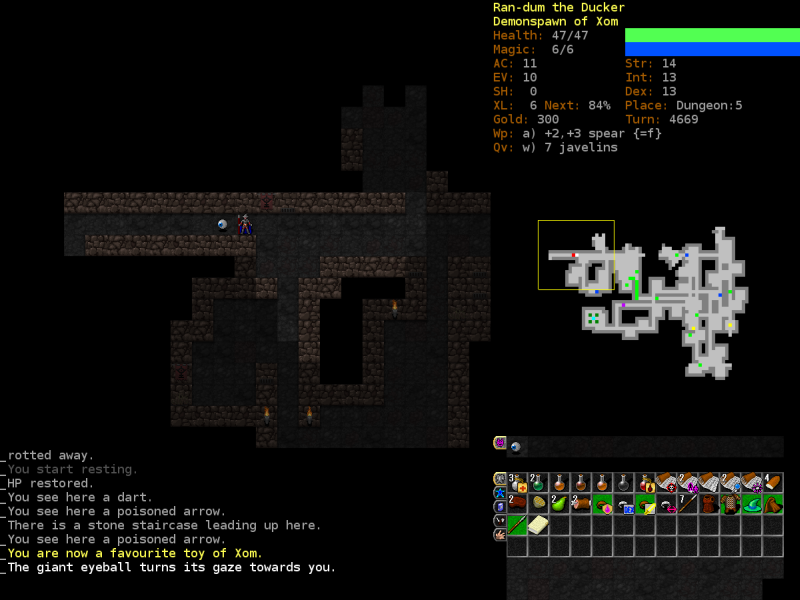 Lair:8 is, like many final branch levels, a fair bit more difficult than Lair:7 and I typically do it once I've cleared another two or so levels lower in the dungeon. Poison resistance is pretty useful as many enemies are capable of putting you into red poison (worse than the standard yellow poison, darker colors denote heavier levels of poison.) 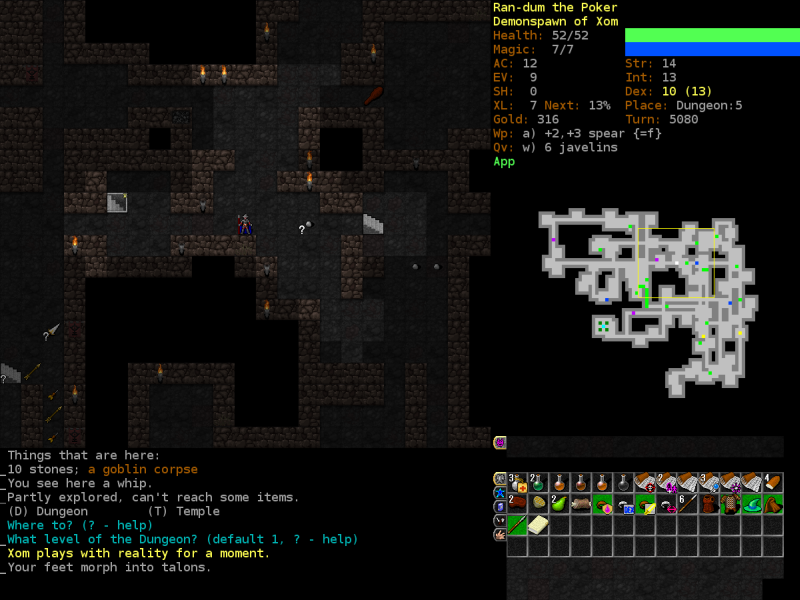 Generally the lair is the first big milestone in the game, both as an accomplishment for getting there the first time and it marks a shift in the dynamics of the game towards a more fair enough, game approach where player deaths are almost always due to player screw-ups.